Changing system-wide DNS is a long-awaited feature in Android, and Google answered it by introducing ‘Private DNS’ in Android 9 Pie. As an add-on, users get DNS-over-TLS (DoT) support as well. Well, Google did the job but not all OEMs are ready to make the change. A classic example of fragmentation in the world of Android – Xiaomi probably skipped this feature altogether in their Android Pie based MIUI 10. Leaving those minor hiccups aside, users can theoretically block ads on Android Pie combining Private DNS feature with a custom DNS provider who blocks ads at DNS level. AdGuard DNS is one such service. They provide multiple platform specific paid adblockers, but the DNS service is currently free. Not only it is platform agnostic, it also supports modern secure protocols such as DNS-over-HTTPS (DoH) and DNS-over-TLS (DoT). Enthusiasts quickly joined the bandwagon and started using AdGuard’s DNS on their phones after getting Pie update. But virtually all of them have encountered an issue where the phone soft-reboots randomly when Private DNS provider is set to AdGuard (dns.adguard.com for “Default” or dns-family.adguard.com for “Family protection”). I get frequent reboots with essential on pie after changing from cloudflare DNS. A soft-reboot is nothing but the automatic restart of the System UI. The full (or hard) reboot needs to restart the entire operating system from scratch, but in these cases only System UI is crashing. The way the bug is spreaded over phones from multiple vendors, it is probably a bug on Android Pie itself. Phones like Google’s Pixel lineup, Essential PH-1, Nokia 6.1, OnePlus 6, Mi A2 Lite – the list of affected devices is just keep expanding. Comment from discussion Bullsquid00’s comment from discussion "OG Pixel sort of restarts every now and then?". Users have posted about the glitch on platforms like reddit, XDA, AdGuard forums and even on Google’s own bug tracker. In fact both Google and AdGuard did officially acknowledge the issue. The issue has been fixed and it will become available in a future Android release. It looks like the bug actually resides deep down in the network stack of Android, as the netd daemon crashes while using the aforementioned DNS service with DoT support. 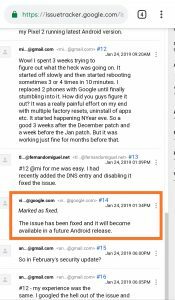 On the other hand, Google doesn’t give any definite timeline of the fix to rollout. It may be inside next month’s security update, or the month after that, or scheduled for Android Q. We are monitoring the issue so keep an eye on this article for updates. What method do you prefer for blocking ads in your Android phone?